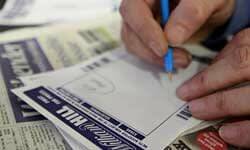 There are many different ways to bet on football, which can be quite daunting when you get started. While everyone knows what a 'single' bet is - and can probably work out what 'doubles' and 'trebles' are too - it soon gets much more complicated. Figuring out the best bets to make money will very much depend on how much risk you're happy to accept. Generally, the more outcomes you need to get right, the less likely you are to win as there always seems to be that 'home banker' which lets you down. There's no easy way to win football bets on a regular basis, but knowing all of your options is a good place to start. So here are the different types of football bets explained one by one. A double is one of the most popular football bets. It simply means that you have picked out two selections you think are going to win, perhaps France to beat Romania and England to beat Russia - as you can see in the example on the right. Doubles are particularly useful when you wish to back odds-on selections (below 2.00 on Betfair). 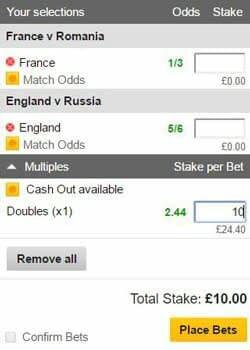 If you were to back France and England as singles and both won, you would not even double your stake. However, you can see that the double would return quite a bit more than double the £10 stake. To calculate a double bet, simply work out the total return for the first selection and then use it as the stake for the second selections. In the example to the right, £10 on France to win would return £13.33 and then all of that on England would return £24.40. A double bet returns a profit when both of the selections you make win, otherwise the bet loses. 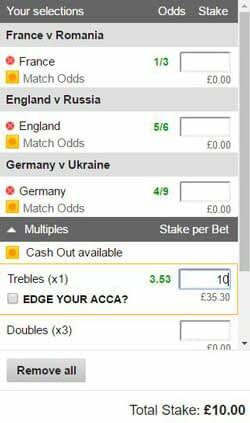 Moving on from double bets, you don't need to be a genius to work out that a treble is three outcomes which make up one bet. In addition to backing France to beat Romania and England to beat Russia, perhaps you wish to also back Germany to beat Ukraine. As with doubles, you need all selections to win in order to return a profit. For example, if France and England won but Germany drew, then a treble would lose. In terms of calculating a treble bet, it's pretty much the same as with a double. £10 on France to win would return £13.33, all of that on England would return £24.40, then all of that on Germany would come to £35.30 in total. Compare that return with what you would end up with if you were to back all three as singles. In that case, you would risk £30 in total (3 x £10 stakes) and your return would only be £16.11. As you can see already, multiple bets quickly compound potential profits as you add more selections. This is what makes them so attractive to punters, but as the risks increase it gets much harder to win consistently. It's a risk/reward that you have to think about carefully. A trixie bet is the first 'full cover bet' that we are going to talk about. What is a full cover bet? 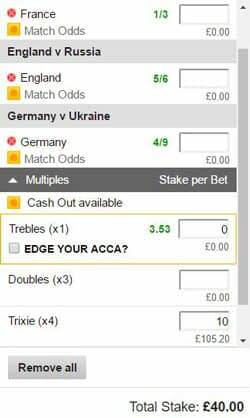 It is a bet which covers all possible doubles, trebles and accumulators across however many selections you choose. When placing a trixie, you choose three selections which means there are three possible doubles and a treble, so four lines in total. While the treble, of course, would be all three together. Why do people choose a trixie bet? Quite simply, because if one of your selections loses then you still have a winning double. For example, if France and England were to win but Germany drew, then your double on France and England would win but the other two doubles (involving Germany) and the treble would lose. What you do have to remember is that this is four lines, so £10 x 4 = £40 stake. It wouldn't be a good idea to place a trixie for short-priced selections as the winning double wouldn't cover the three losing lines. In that situation, it would be better to place a treble only. 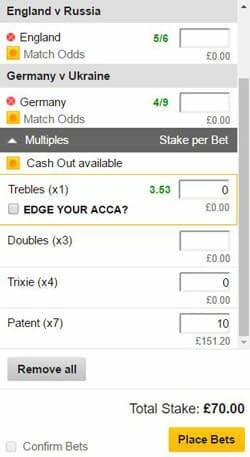 A patent bet is another full cover bet, similar to a trixie but with the addition of three single bets on top of the three doubles and a treble. That means seven lines in total. Sure, it means that you would only need to hit one winning selection in order to get a return on your bet, but the total stake would be significantly higher. If your only winning selection was priced 2.00 then you would be down by £50 overall. Even if your only winning selection was an away underdog at 5.00, you would still make a loss of £20 overall. As you can imagine, patent bets are not much use when betting on Match Odds markets. For patent bets to be effective when betting on football, you would need to be looking at higher priced selections. Perhaps correct score bets or first goalscorer bets. It is not a bet type that I use personally. I tend to stick to doubles and the odd treble here and there. By the way, sometimes the patent is referred to as a 'twist bet' so do not get caught out if you see it called that from time to time. A yankee increases the number of selections you are betting on to four, so let's say that you are adding Spain to beat the Czech Republic in addition to France, England and Germany. 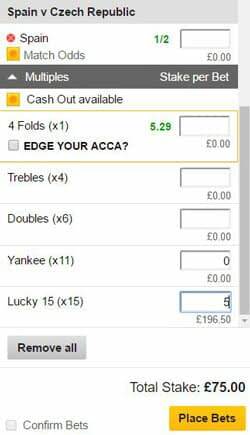 There are 11 lines which make up a yankee - six doubles, four trebles and a four-fold accumulator. 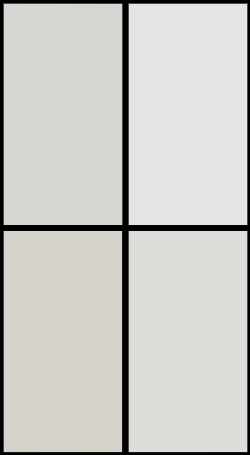 And then the four-fold accumulator would include all four teams. You would only need two winners in order to bring in a double, but would it be enough profit to cover the ten losing lines? In horse racing, you can also place each way yankee bets which doubles the number of lines to 22. In that case, your stake would be £10 x 22 = £220. The stakes quickly rise as you try to cover more outcomes. A lucky 15 bet is a yankee with four singles added on. It consists of 15 lines; four singles, six doubles, four trebles and a four-fold accumulator. This means that you only need one of your selections to win in order to get a return, while your winnings will increase with each extra selection that ends up going the right way. Lucky 15 is an odd name for a bet, but it's perhaps more of a marketing ploy by the bookies. The 'lucky' part comes from bookmakers typically offering a bonus, for example doubling the odds if only one of your selections wins. It's not particularly generous considering the fact that 14 of your 15 lines just lost, but that's bookies for you. They're more than happy to pull you in with bonuses, as long as they know that they'll still be in profit overall. You can also add a fifth selection to create a lucky 31 bet, which works in exactly the same way. A heinz bet works in a very similar manner to the lucky 15 and lucky 31 bets explained above, but there are six selections being made this time. Therefore, there are 57 lines; 15 doubles, 20 trebles, 15 four-folds, six five-folds and a six-fold accumulator. 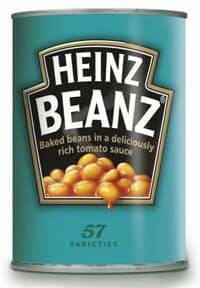 The heinz bet is named as such because of the famous Heinz '57 varieties' advertising slogan. Due to the fact that there are no single bets as part of the heinz, you need at least two winning selections in order to get any sort of a return. Of course, in an ideal world all six of the teams on your heinz bet would win. However, even if one or two let you down you can still expect to receive a decent return if you back at decent odds. If you add a seventh selection, your heinz becomes a super heinz bet. That takes the number of lines in play on the bet up from 57 to 120. A Canadian bet - sometimes referred to as a 'super yankee' - is made up of five selections. Going back to our example from earlier, we had already added France, England, Germany and Spain to the betting slip and looked at various multiple bet options. Now, assume that you are also going to add Portugal to beat Iceland. The bet now consists of France to beat Romania, England to beat Russia, Germany to beat Ukraine, Spain to beat Czech Republic and Portugal to beat Iceland. 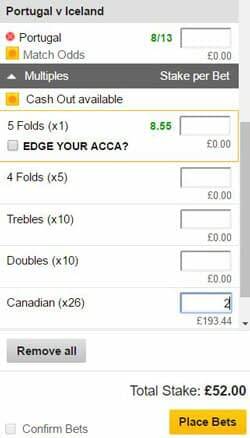 There are 26 lines in a Canadian bet; 10 doubles, 10 trebles, 5 four-folds and a five-fold accumulator. As with the heinz bet above, as there are no singles involved in a Canadian which means that you need at least two of your selections to win in order to get a return on your bet. As the number of selections increases, the likelihood of them all winning reduces. There's always a favourite or two which fails to win and the more teams you choose to back, the more chance of hitting one of the surprise results. The bookies know it'll happen, which is why they happily offer these bets. The last type of football bet we are going to cover today is the goliath, which is by far the biggest multiple bet of the lot. 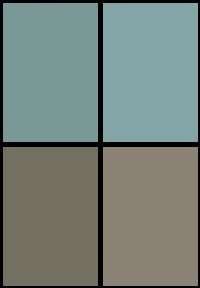 After adding an eighth selection into the mix, the aptly named goliath consists of a whopping 247 lines. 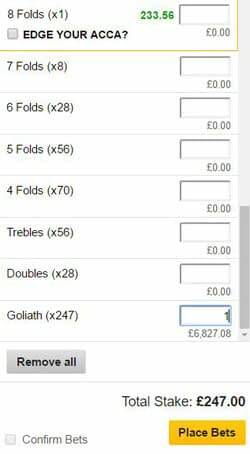 The 247 lines in a goliath bet are; 28 doubles, 56 trebles, 70 four-folds, 56 five-folds, 28 six-folds, eight seven-folds and an eight-fold accumulator. With no single bets in play - which is just as well as 247 lines is more than enough! - you will need at least two of your eight selections to win in order to receive a return on a goliath bet. Is a goliath bet worth it? Personally, I can't imagine backing any more than a treble and - more often than not - I stick to doubles. It's already tough enough to find a steady stream of winners at decent prices without making it this much more difficult. Whenever a lucky punter hits a huge winner, the bookies make sure that it's in all the newspapers. Why? They want lots more people to place crazy bets the following weekend so that they can make even more profit! Don't make it easy for them.